Rounding your prices is one of the oldest tricks in the retail playbook. It is incredible how many shoppers believe an item is costing them $12 instead of $13 when they see the price tag with $12.99 on it. XpertMart™ gives you the tools you need so that this price rounding occurs automatically. There are basically two places where you can setup price rounding, depending on whether you want to round the List Price of items or whether you are rounding the prices of a specific price list. Since you can sell at List Price or you can sell at the price appearing on a given price list you might want to use both methods. Even if you don't sell at List Price some retailers like to print these prices out and display them (so they can show their customers how much they are saving) so you may want to round your List Prices even if you don't use them for Transactions. If you want to round List Prices, open the Configure>Inventory Configure Menu and select the List Prices tab. Enter the amount you want XpertMart™ to automatically deduct from your List Prices. In the example below, XpertMart™ will subtract $0.01 from every price, turning $13.00 into $12.99. However, note that the rounding you set here will only cause take effect when you do a mass price change to the Styles List Price via Processes>Prices and Costs>Change Style Price or Cost. (If the only change you want to make to your List Prices is the rounding then simply use a multiplication factor of 1 to make sure nothing else is changed). 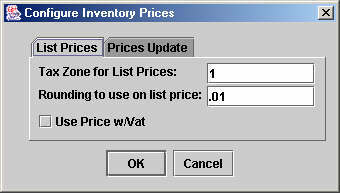 If you have selected the "Use Price w/Vat" checkbox then the system will round to the unit specified the List Price with VAT. If you have not selected this checkbox then it will round the List Price before tax. If you want to round the prices in the Prices Catalog of a specific price list, use the "Round To" and "Round Adjust" fields in the catalog. You have to enter these values individually into each record in the catalog or use the Replace Where function to set these values for multiple records at once. When the Update Prices process is run (and only then), XpertMart™ will round the prices as per these values. The system rounds the price off to an even unit specified in "Round To" field. Then it subtracts from this rounded price the "Round Adjust" amount. If you are setup (for that particular price list) to use VAT the system will round the Price with VAT, otherwise it will round the price before VAT or tax. Example1: If you set the Round To value at $1.00 and the Round Adjust value to $0.02 then all of your prices will end in $.99 ($1.00 - $0.02 = $0.99). Your prices will be $12.99, $29.99, and so on. Example 2: If you set the Round To value at $0.50 and the Round Adjust value to $0.01 then all of your prices will end in $.49 or $.99 ($0.50 - $0.01 = .49 or .99). Your prices will be $12.49, $23.99, and so on. So if the price that is being rounded is $12.56 and the "Round To" value is $1.00 then the price becomes $13.06. XpertMart™ then drops the fractional part and it becomes $13.00. Finally, it subtract the amoun in the "Round Adjust" field.